A lot has changed in Massachusetts and around the globe since 1950, when Wildwood opened as the first youth overnight camp in New England to focus exclusively on natural history education. Since then, summer camps and schools across the country have been discovering that nature education is a crucial element of youth development. Many studies have shown that time spent outdoors provides children with a number of physical and mental health benefits. Additionally, children who develop a strong connection to the outdoors will value conservation throughout their lives. Although educational perspectives have evolved, Wildwood’s central focus on connecting kids with nature—and teaching campers about our role in protecting it—is one thing that will never change. One of the best things about a camp with a history as robust as Wildwood’s is getting to compare what has changed over time along with what has remained consistent. Last summer, camp alumna Barbara Harting gave us the opportunity to do just that when she reached out to share photos taken by her father at Wildwood in the mid-50’s when Barbara and her brothers were campers and their father was the official camp photographer. 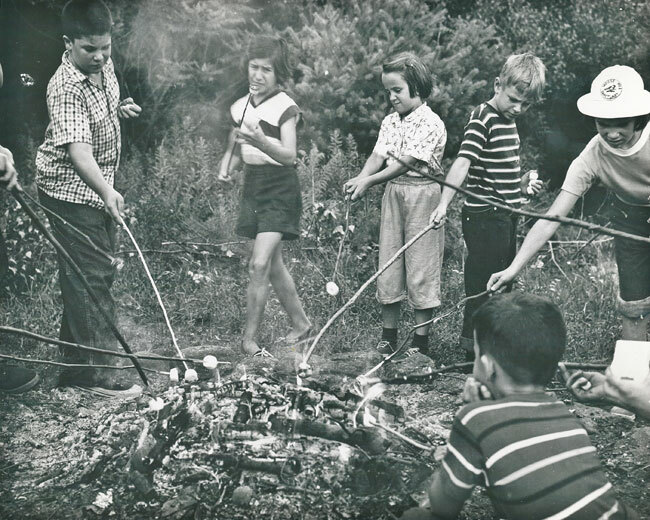 Aside from the black-and-white photography and mid-century clothing, it is remarkable to see how similar these scenes are to what we see at camp today. In this gallery, we’ve paired Barbara’s photos (taken at Wildwood’s original location at Cook’s Canyon in Barre, MA) with photos from our current home in Rindge, NH. We hope you’ll enjoy, as we have, the common threads that continue to weave our story and withstand the test of time. Have favorite memories of Wildwood you’d like to share with us? Email your photos to wildwood@massaudubon.org. This entry was posted in summer camp, year-round on February 10, 2017 by Welch Narron.